Demonstrators gesture with their hands up after protests in reaction to the shooting of Michael Brown turned violent near Ferguson, Missouri on August 17, 2014. The unrest that has roiled the city of Ferguson, Missouri, since police fatally shot an unarmed 18-year-old African American, Michael Brown, over a week ago, continues unabated. 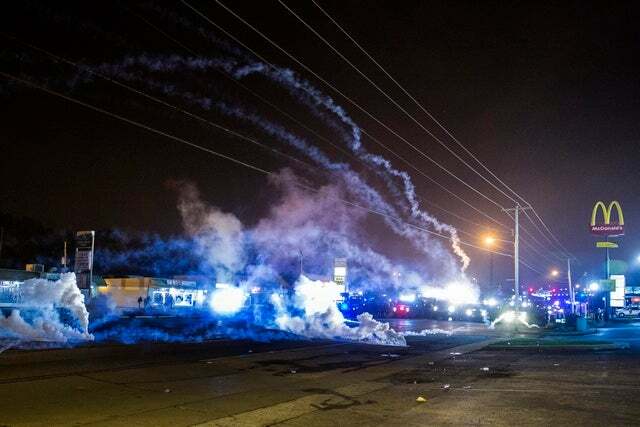 Sunday night was reportedly the most violent yet, with police firing teargas and rubber bullets and using sound cannons against protesters; Missouri Governor Jay Nixon is calling in the National Guard. Last night’s police actions took me and many of the protesters I spoke to by surprise, not only because they happened well before the curfew, but because while the crowd I saw was angry, it also seemed peaceful. Yet as I was leaving the barricaded protest area, I saw half a dozen police cars pull up and a group of officers donning gas masks and preparing to enter the protest zone. Police say that they came under assault from gunfire and Molotov cocktails. I can't say with certainty that they didn't. But that’s not what protesters on the scene told me; four who had been at the front of the protest said that they didn’t see any attacks on the police, but that the police began teargassing them when the protesters simply tried to go past a line police had said they shouldn’t cross. They saw some protesters smash the windows of a McDonald’s as they were retreating, and throw teargas canisters back at the police—but that’s a far cry from the violence the police have described. The heavy-handed police response to the protests over the past week has done nothing to change that perception. On Sunday, Chandler went to the main protest site on West Florissant Avenue with her 15-year-old daughter, where she said protesters were gathered and milling about. She said that, around sunset, police arrived and ordered the crowd to disperse. As she and her daughter were trying to leave, her daughter was teargassed. Since then, they’ve been going to the quieter, smaller protest site on a tire shop parking lot across the street from the Ferguson police department, about 2 miles away. Late Wednesday night, police drove up to that site in armored trucks and full military-style gear, she said, and ordered them to leave: “They had about 40 or 50 men in it looked like military gear with M-16 [assault rifles], pointing them directly in our faces, and they put the gun in my daughter’s face, and [told us we were] trespassing,” she said. (She said that they had permission to be there from the tire shop's owner.) Chandler saw one woman, a pastor, get shot in the stomach with a rubber bullet. Chandler’s account of her experiences throughout the last week of protests—echoed by many others I've heard in the last 24 hours—indicates that the police have used unnecessary or excessive force and tactics of intimidation to deter people from exercising their rights to protest peacefully and express their views in public. New concerns are raised by bringing in the National Guard, a branch of the military that lacks full training and experience in law enforcement.